Zane Benefits, the #1 Online Health Benefits Solution, announced today the publication of a free eBook "The HR Professional's Health Benefits Planning Workbook". The new eBook helps HR Professionals at small businesses evaluate, plan, and budget for health benefits. 2014 is here and health benefits are on everyone's mind. For small businesses with limited resources and capital, these tasks can feel daunting. 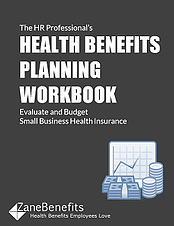 The new workbook provides HR professionals and small business owners seven (7) hands-on worksheets, charts, and assessments to successfully evaluate and budget for health benefits. >> Download the eBook Now! Zane Benefits, the #1 online health benefits solution, was founded in 2006 to revolutionize the way employers provide employee health benefits in America. We empower employees to take control over their own healthcare, while helping employers recruit and retain the best talent. Our online solutions allow small and medium-sized businesses to successfully transition to a health benefits program that creates happier employees, reduces costs and frees up more time to serve their customers. For more information about ZaneHealth, visit www.zanebenefits.com.